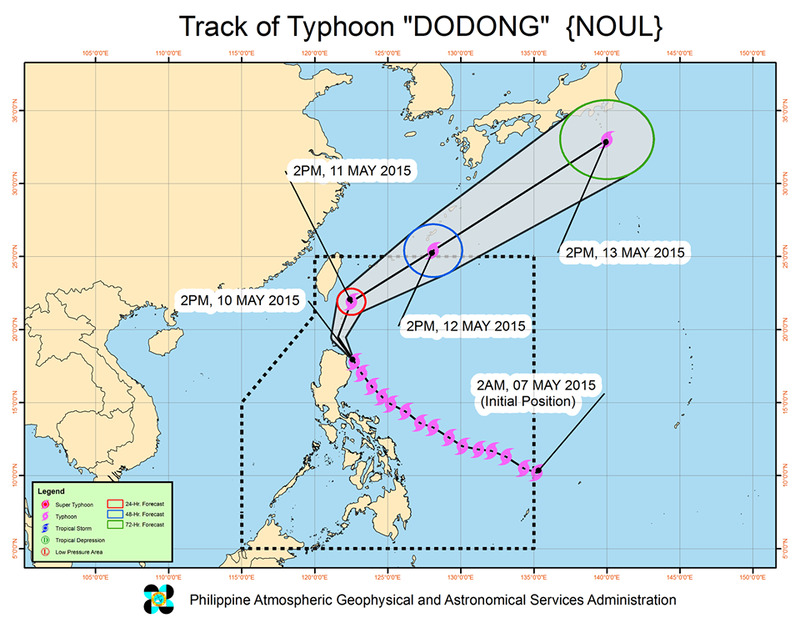 MANILA, Philippines - State weather bureau PAGASA on its latest weather update released on Sunday, May 10, 2015 said that Typhoon Dodong has made landfall over Pananapan Point in Sta. Ana, Cagayan at 4:45PM today. At 4:00 PM today, the center of Typhoon Dodong was located based on Aparri Doppler radar and all available data at 95 km Southeast of Aparri, Cagayan (18.1°N, 122.5°E). 'Bagyong Dodong' has maximum sustained winds of 185 kph near the center, gustiness of up to 220 kph and forecast to move North Northwest at 17 kph. 48 hour (Tuesday afternoon, May 12): 830 km Northeast of Basco, Batanes. (25.4°N, 128.1°E) (outside PAR). PAGASA raised Public Storm Warning Signal Signal (PSWS) 4 (171-220 kph expected in 12hrs.) over the following areas: Northeastern Cagayan, Batanes, Babuyan and Calayan Group of Islands. The wave height at open sea is more than 14.0 meters. PSWS 3 (121-170 kph expected in 18hrs.) declared for the rest of Cagayan, Isabela and Apayao. Wave height is at 14.0 meters. PSWS 2 (61-120kph Expected in 24 hrs.) in Northern Aurora, Kalinga, Mt. Province, Ifugao, Ilocos Norte and Abra with wave height of 4.1-14.0 meters range. Meanwhile, PSWS 1 (30-60kph Expected in 36 hrs.) raised over the rest of Aurora, Ilocos Sur and Quirino. The wave height is at 1.25-4.0 meters approximate. Stormy weather with rough to very rough seas will be experienced over Cagayan Valley, Cordillera, Ilocos Norte and Northern Aurora while Ilocos Sur and the rest of Aurora will have rains with gusty winds. Cloudy skies with light to moderate rains and thunderstorms will be experienced over rest of Ilocos region and rest of Central Luzon. Metro Manila and the rest of the country will have partly cloudy to cloudy skies with isolated rainshowers or thunderstorms. Moderate to strong winds blowing from the Southwest to South will prevail over the rest of Luzon with moderate to rough seas. Estimated rainfall amount is from heavy to intense within the 100 km diameter of the typhoon. It is expected to exit PAR by Tuesday morning (May 12). Residents in low lying and mountainous areas of the provinces with Public Storm Warning Signals are alerted against possible flashfloods and landslides. Storm surges of up to 2.0 meters are possible over Gonzaga and Sta. Ana Cagayan. 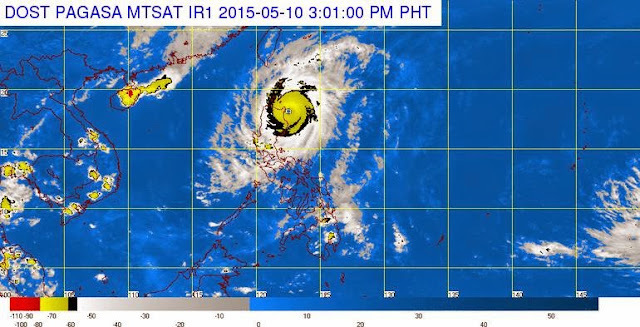 Fisherfolks are advised not to venture out over the eastern seaboard of Southern Luzon. It is advised to refrain from outdoor activities particularly along beaches of the eastern section of Isabela and Cagayan today (May 10). Public Storm Warning Signals elsewhere are now lifted.